Measures a leader's skill in the 22 Core and Adaptive leadership competencies most critical for job performance. Leaders rate themselves and receive ratings from their peers, supervisor(s), subordinates and others (such as customers). This process increases self-awareness and drives skill development. Results are delivered in a report that highlights strengths, areas for improvement, and differences/similarities in views of behavior. Report includes e-learning featuring clips of Hollywood movies, television, and historical events plus a complete online Goal Tracking System™ to ensure lasting change. 360º Refined is fast, clear and complete. In just 15 minutes participants deliver feedback through 75 closed-ended questions and four open-ended questions. • A leader is invited to rate him/herself online, as is his/her boss(es), peers, direct-reports, and others (such as customers). You control the administration and watch the responses come in. • Once responses are in, you open the report at the click of a button. Responses remain anonymous, so a leader can administer his or her survey if needed. TalentSmart survey designers and consultants spent years deciphering the core set of skills that separate good leaders from the great ones. 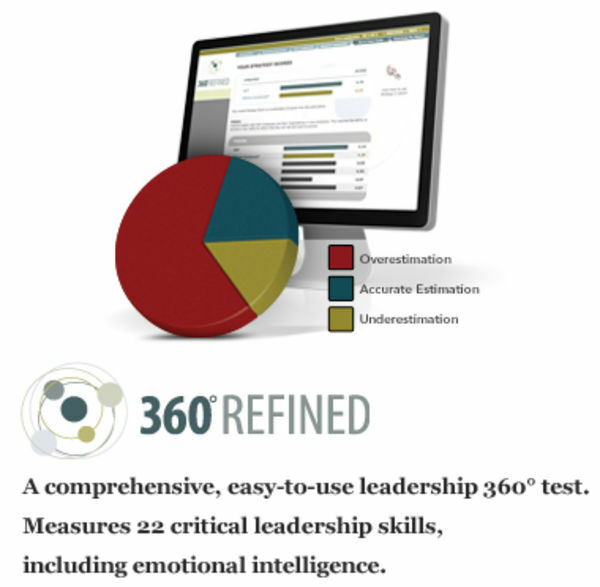 360º Refined is backed by sound research, and is a reliable and valid measure of the skills needed for success.